Gerald A. “Jerry” Bean is this year’s recipient of the California Press Foundation’s Philip N. McCombs Achievement Award. Bean has been in the newspaper business since 1957. He got involved in the weekly newspaper business when he was in the ninth grade. Jerry was a part-time sports reporter and printer’s devil for his hometown newspaper while still in high school. He grew up in Lacon, Ill., a beautiful little town of 2,000 people on the Illinois River near Peoria. After graduating from the University of Illinois in 1966, Bean moved to Rockford, III., where he had served as a summer reporting intern with what is now the Rockford Register Star, then a locally owned 90,000-circulation morning-afternoon daily. Over the years, he moved through the newsroom and general management ranks. Gannett bought the paper in 1967, opening up tremendous opportunities for advancement. He became publisher in 1979 at age 36. 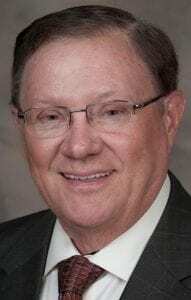 He was named publisher of the Register Star in 1979 and founding general manager of USA Today in 1981, leading to the launch of the national newspaper in 1983. After that, Gannett transferred him to San Bernardino, where he served as publisher of The Sun until 1986. That’s when he started buying weekly newspapers throughout California, ranging from Fontana to the Central Valley to La Cañada-Flintridge in the Los Angeles area. He now owns papers in Fontana, Highland, Yucaipa and Banning. In 2006, Jerry served as president of CNPA, after rising through the executive ranks of office. He received Cal Press’ Justus F. Craemer Newspaper Executive of the Year award in 2008. In addition to his good work in publishing community weekly newspapers, Jerry has been quite effective in making a positive contribution to his community. In 2010 he retired and took the title chairman of Century Group Newspapers. He ran for Redlands City Council, which he won, and served a full term before moving aside to let others serve. Bean will be honored Dec. 7 at Cal Press’ 141st Annual Winter Meeting, to be held at the Marines’ Memorial Club & Hotel in San Francisco. Click image above for details. The Cal Press event begins Thursday afternoon, Dec. 6 and continues through mid-afternoon on Friday, Dec. 7. We hope you can join us. 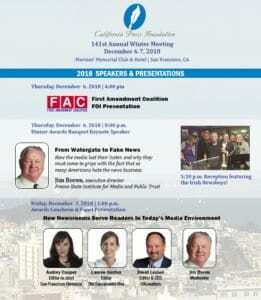 The discounted Cal Press hotel room block expires tomorrow, Wednesday, Nov. 14. Wednesday is also the early-bird registration deadline.